Now that Emily has her own Sewing Tub, she has been quite motivated to sew. Last week she asked for felt with which to make her own small felt board, so we stocked up with the 29c craft felt sheets at Michaels. 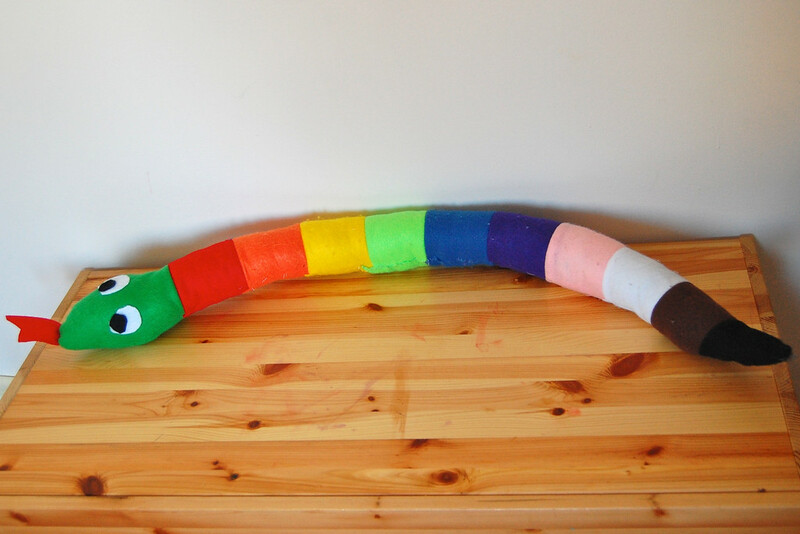 This week she wanted to sew something, so we decided to use up as much of her stash as possible, to make this simple snake (which I thought could also be a good draught-stopper if placed close to the bottom of a door). 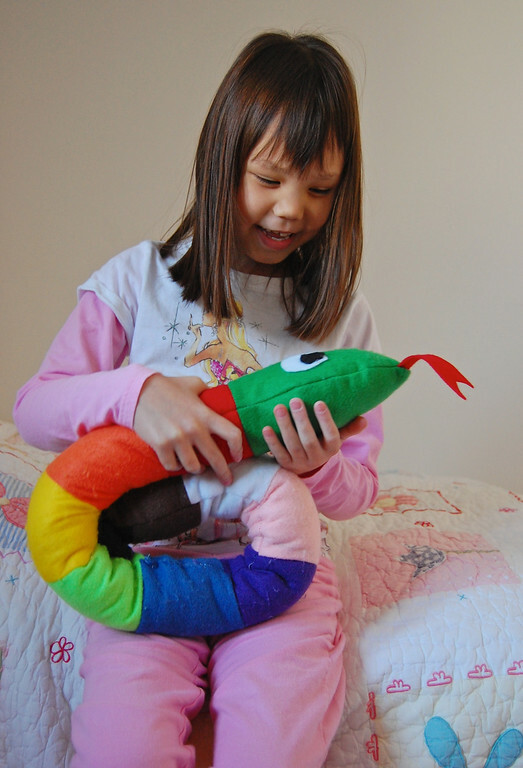 It is a large item, which to a child, translates to A Substantial And Challenging Project. It mostly involved straight line stitching to connect the bands of the body, and some sewing-around-curves for the head. In attaching the head and tongue, Emily got to learn about laying sticky-out-things inside out and pointing backwards, so that they stuck out the right way when the whole thing was turned right side out. Because she's watched me make so many softies, she was already familiar with the concept of leaving an opening for turning out and stuffing. But it was a new thing for her to sew that opening shut! She was given a threaded and knotted needle, shown how to pinch shut the opening and do the whip stitch (we'll teach her the ladder stitch when she is older). She did really well, and I'm thinking that we can now make any number of 2D projects that involve whip-stitching and stuffing. Preferably not with pillable, synthetic felt, though! 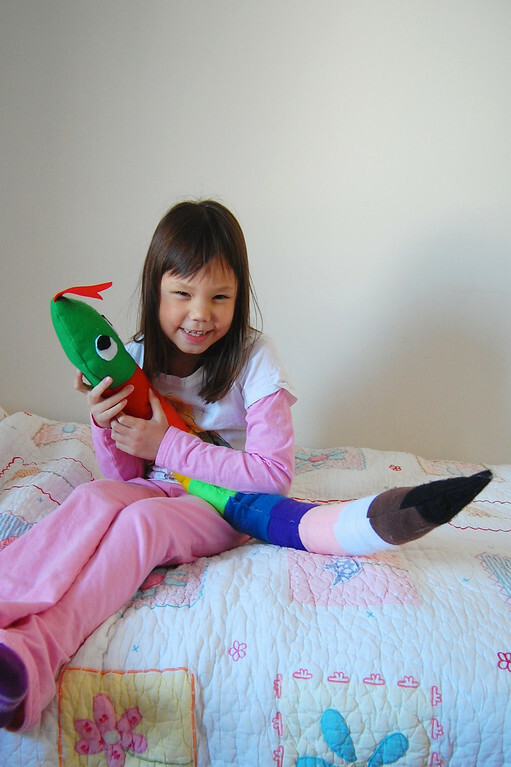 Jenna, who, if you remember, loves all things rainbow, immediately wanted to make her own rainbow snake. Fortunately, it was dangerously close to dinnertime, so we didn't. But since I owed her her own DIY rainbow project, we made cupcakes (for eating) yesterday and used 6 different frostings. This (the snake, not the cupcakes) took us about an hour and a half to make, from the time we started cutting the pieces out to the time Emily stitched the opening shut. Emily used the sewing machine for everything except that opening. The eyes were glued on. 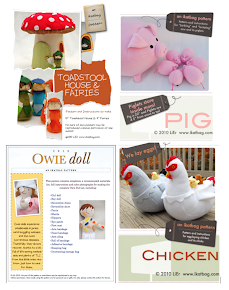 For those interested, here and here are archive links to two other sewing projects to do with young kids. That's the cutest draught stopper I ever saw! I'm very impressed that she made it all on her own! 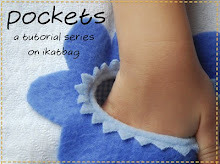 What an adorable project!!! LOVE IT! I just happened to find your blog and I LOVE it! Was surfing around in endless breastfeeding-sessions... Will follow it now! You have a huge fan in Switzerland! How fun, she did a great job! Makes me so excited for when my own little daughter is old enough to start sewing too. I'm a new visitor to your blog! My soon to be 6 year old is getting a machine for her birthday. I was wondering if you could share what is in her "sewing tub"? Thanks so much!